Like many anglers, I come from a traditional spin casting and bait casting western background. 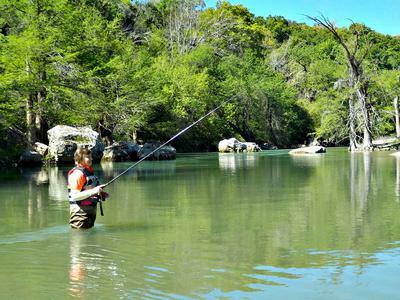 Born and raised in Texas, I saw few fishermen who practiced fly fishing in any form. I did try western fly fishing for a few months, but it never stuck. It was one notch too complicated for me, plus, I just didn’t catch many fish that way. Then, one day, while web surfing, I stumbled on a YouTube video of tenkara angling and also found Chris Stewart’s Tenkarabum website. I was intrigued enough to dip my toe in the water, and within a few months, I had almost completely switched to tenkara fishing. That was four years ago, and, the more I use my tenkara and keiryu gear, the more I like it. I sat down the other day and tried to figure out what the appeal is, at least for me. Three advantages stick in my mind, though others may practice tenkara for different reasons. See what you think. First, tenkara is unencumbered fishing at its best. Often, I hear the word “simple” applied to tenkara, but I don’t know if that’s exactly right. I don’t guess that a precisely engineered carbon fiber rod that weighs less than two ounces is simple. I do enjoy the fact, however, that I can take that extremely lightweight rod, a small mint tin of flies, a few feet of line, and fish all day. Plus, when I hook a fish, because the line is attached to the tip of the rod, the connection with the fish is direct. The rod comes alive when I hook a bluegill or a bass. There’s something very appealing about sliding my Zimmerbuilt sling pack over my back and wading into a local creek with a finely crafted tenkara rod in my hand. I feel a part of nature in an unencumbered way. Tenkara is angling in one of its purest forms. Second, tenkara allows me to fish water that was previously inaccessible. Using a slingshot or bow-and-arrow cast, plus a short tenkara rod, I can fish shallow, brush-choked water that just wouldn’t work with my traditional western gear. You know, that little stream just down the road, the one other anglers bypass? I’ve been fishing there all summer, fall, and winter. Often, I’m the only one on the water, and I can place bait or lure in pockets that other fishermen can’t get to. Tenkara anglers are the masters of the thin blue lines on the map. Third, I catch more fish. Most of us go fishing to catch fish. Yes, I know that being outside, enjoying the breeze, and wading is all fun; but, you brought that rod along for a reason. Tenkara allows you to delicately present a fly, with a perfect drift, in water that you know holds fish. When I started fishing with my tenkara rods, my catch immediately went way up. Done right, tenkara angling is the softest of whispers, a butterfly’s wing on the water, a natural presentation that is nearly irresistible to fish. Whatever you lose because of the short line, you more than gain back with the tenkara cast and drift. Doesn’t this explain why tenkara developed in the mountain streams of Japan, where anglers had to catch fish to live? It works here, too. Unencumbered fishing, new water, and more fish are all reasons why I started and stuck with tenkara. I would like to add two other points to your well written report. The flip side - I find that I often out fish others at popular fishing spots. 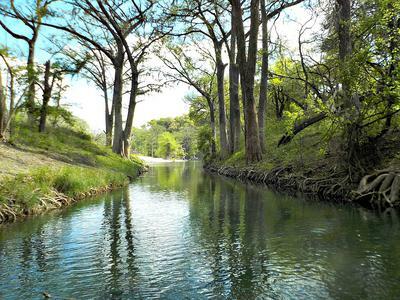 Wilson Springs is open all year, and being a large spring has a perfect temperature year round for trout. It is planted at least every other week. 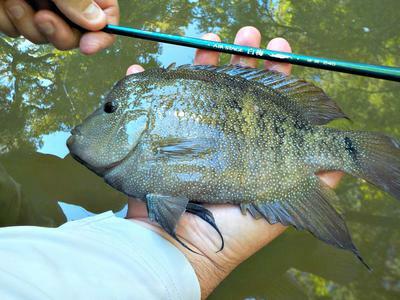 Tenkara or fixed line fishing allows presentations to pressured fish that they respond to. I had plans to do some brush busting along the Boise River today, but wasn't feeling that good. I headed over to Wilson Springs, and was the only one who caught fish in my area the two hours I fished. Two Dinsmore #10 split shot with a Red Wiggler on a size 14 hook produced 9 trout and 5 other hook-ups. I had a lot of dirty looks today. I was fishing my new Diawa Sagiri 45 at the 40 setting and the TenkaraBum 40. Both are loads of fun. It was zero misses with the TenkaraBum 40. I really like both of the rods, but I am glad the only holdover a 14 incher was caught on the TenkarBum 40. I walked over to Wilson Creek to see if there was a fish in my favorite pocket. Nobody was home. As I walked back to the car, there were two guys fishing in the spot where I had been. They had been watching me. One asked, "What were you fishing with?" I said, "Worms." He said, "That's what we are using." I walked over and they had at least 12 pound test line on, 6-8 pound leader and at least a size 6 hook with a half of a nightcrawler. I said, "Your rig is too heavy." I gave them each 2 of my Gamakatsu R10B size 14 setups with 6.5x tippet leaders and the rest of my red wigglers. I told him to lighten his drag on his spinning rod setup. I showed him how to hook a wiggler. He asked about my rod, so I told him a little about fixed line fishing and gave him one of Chris' cards. I was feeling tired, so I said, "good luck." As I let the car warm up, I smiled as I saw his rod bend. I don't know if he landed the fish. The second point is the breadth and width of fixed line fishing. I have fished my Kureani 30 and Shimotsuke Kiyotaki for micro fish and had a blast catching 1.5 - 3 inch fish. On the other extreme I have fished the Nissin Kyogi rods and caught many fish over 10 pounds. I have caught lots of fish between those two extremes. It is only on the TenkaraBum website you can find so many rods to cover all the fishing possibilities. Whatever you fish for, there is a fixed line combination that will accommodate you. Reminder: Anonymous submissions will not be printed. What is a sling shot or bow and arrow cast? I'm new to this. I could guess, but would like specifics, thanks. Thanks for the question. If you google "Slingshot! Tenkarabum", you'll find a little article with photos that I posted on the Tenkarabum website about the technique. The photos sort of explain it. Also, if you go on Youtube, there are some good explanatory videos. I always urge folks to be careful using the technique, however, so that you don't hook yourself. The slingshot cast will allow you to place a fly in very tight circumstances, under trees, when there's brush behind you, and so forth. It's pretty easy to learn and very effective.